REMEMBER, THIS IS THE BETA VERSION OF DONE! Things could go wrong. Horribly wrong. BP WRONG. Use at your own risk. Enter tasks on your webOS device or on the Toodledo web site. Synchronize so that your to-do list is always with you, no matter where you go. You can enter, edit, check off or delete tasks on the device when you're away from a data connection and sync later. You can search for tasks on the device by simply typing while in the tasks list. Choose to sync manually, on app launch, on app close, or auto-sync every half hour. Done will only sync when an internet connection is available - and you can even choose to sync only by wifi! Done! 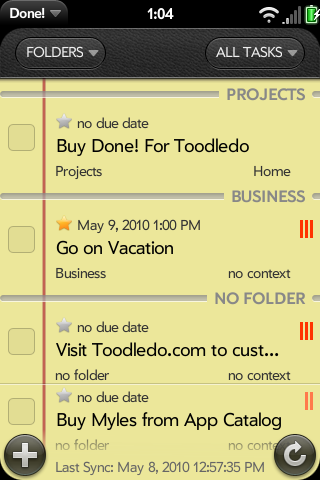 allows you to filter tasks by Folder, Context, Status, Due Date or Priority, view your Toodledo hotlist on the device, and to view completed tasks on the device. Give Done! a try and learn why it's the best tasks app for webOS!